A little extra exposure to commodity prices for a pipeline company is the last thing you want in today's market. What: Shares of Midcoast Energy Partners (NYSE:MEP) declined more than 13% in September following a decline in oil and gas prices as well as general weakness across the energy space. So what: As with most other pipeline companies this past month, we need to put Midcoast's decline in a little bit of perspective. First, the entire MLP sector declined for the month, which is best described by the 12% decline in the Alerian MLP ETF (NYSEMKT:AMLP). 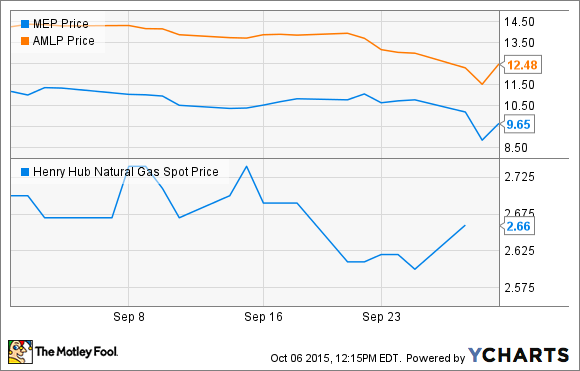 To add insult to injury, the Henry Hub spot price for natural gas remained rather low -- at about $2.66 per thousand cubic feet today -- throughout the month. So Midcoast was already trying to swim against the current. Typically, oil and gas prices don't have much of an impact on a pipeline company's business, because most of them structure service contracts in a way to isolate themselves from prices. This approach normally means that 75% or more of their gross profit comes from fixed-fee contracts. As a result, most pipeline companies' stocks don't fluctuate as much with commodity price swings. Midcoast, on the other hand, doesn't have as many of its gross profits coming from these contracts. According to management, a little more than half of the company's gross profits come from fixed-fee or minimum-volume-commitment contracts. Granted, the company has hedges in place to cover more than 90% of its gross profits for all of 2015, but unless it can renegotiate with its customers to move toward fixed-fee contracts, it may be exposed to commodity prices, as those hedges will expire over time. Now what: With shares of Midcoast down more than 50% over the past 18 months, is it worth jumping into a stock with a current distribution yield of greater than 12%? There are some factors working in Midcoast's favor. such as its well-financed owner in Enbridge Energy Partners (NYSE:EEP) that also has the ability to drop down several assets to Midcoast. What will make those dropdowns challenging, though, is that Midcoast will probably need to issue shares to pay for them, and at today's share price, that isn't as attractive of an option as it looked just a year ago. With a cramped ability to grow and the challenge of getting its existing assets supported by fixed-fee contracts, Midcoast faces some pretty strong headwinds. So unless there are some significant changes to the company's contract structures and it finds a way to cheaply pay for some new assets, it may be best to turn down that tempting yield for now.